I just came back from a good dinner at one of the local restaurants. Every time I visit this place, I always remember the bright smile and an ever-great greeting from this porter, always standing at their main gate, greeting every guest with a handsome salute and a contagious smile. Every time I visit this place, I just can’t help but wonder how he manages to keep doing the same thing, over and over again. And, this guy doesn’t get any tip for doing it, none whatsoever. Never. Zilch. And, this guy, the porter, is not alone. There are many employees (if you want to call them that) that love their job so much that they just don’t care what the incentive is. They just want to excel at what they do. They just love the work they do. And that’s the kind of employee one should ever want in their team for the right job. 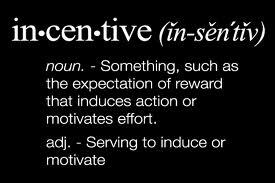 No incentive ever helps if the person you employed doesn’t love doing “what you expect them to do”. You are much better off employing people that love what you wish they do. And no incentive is ever required. On the Corollary, no matter how much you incentivize people to do what you expect them to do, if you’ve got a frog to do an ant’s job, they would never excel in it, no matter how easy or straightforward it could be, and no matter what the incentive. No amount of incentive can ever make up for a bad job-resource fitment. They would only realize the existence of incentive at the end of the quarter, or at the end of the year and wondering – Incentive, what incentive? And What for? and you will be forever left wondering why people can’t fit into their jobs, and do what you expect them to do. Recipe for failure or success, you choose. This entry was posted on March 19, 2011, 6:30 pm and is filed under Human Behavior, Leadership, Management. You can follow any responses to this entry through RSS 2.0. You can leave a response, or trackback from your own site. Incentive not required, but how do you address bad reviews for appraisals? If some one telling you blindly that you are worthless, what will be your response? In such a case, how do you rate your employer? What is the major reason, employees leaving their organizations? Do you believe all that employees are non-performers? I’m not sure how the monitory side of the things (variable pay) are strive to balance with negative reviews, which indirectly will tell the world that, the company where the employee works is a sinking ship. I’m 100% agreeing with your statement that most of the employees love to perform their tasks with full heart. What %ge of ego play in employee reviews? I like your article in blog, but I request you to write more on the subject. I will attempt a quick (but twisted) answer to that though. Most people leave because of bad immediate managers, not just because they were employed for a wrong job. As for as appraisals, ego clashes, bad reviews are concerned – they belong in the immediate manager bucket, and not in the employer bucket. A great company will always promote great leadership and empowering management practices, but easier said than done when you have to decide on the fate of a great performer who also ends up being a bad manager.